The subwoofer has brought revolutionary change in sound. Though it is mostly used in home theatre, it can also radically improve the performance of the factory stereo. It can develop a foundation which helps several speakers to muster. However, adding a subwoofer means not only a deep bass but also overall improvement of the sound system. A subwoofer can change your experience of listening to the music. Nowadays, almost all speakers or stereos come with an opportunity to be installed with a subw​​oofer. Hence, you must have an in-depth look that the RMS should match with your amp. The amp must be more potent than the subwoofer. Unless it is more powerful, the bass will be distortion. 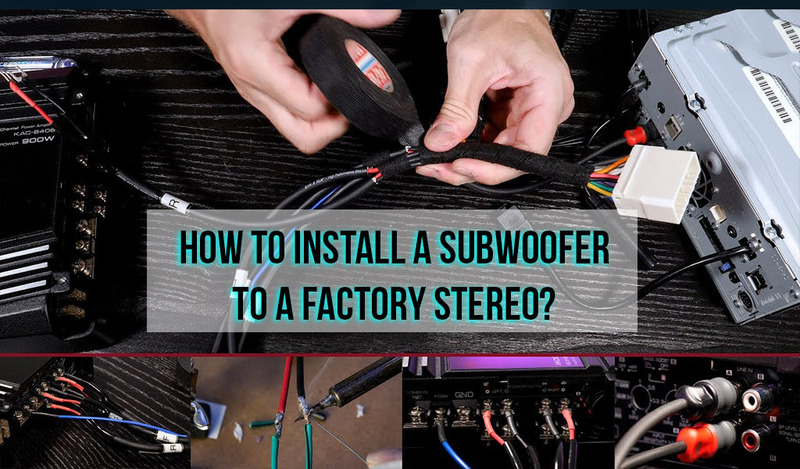 However, you can install a subwoofer to a factory stereo by following the below steps. It is the most important part to install the subwoofer. So, you have to pay deep attention to choosing the best RMS value, frequency range, SPL and the ohms. The amplifier, as well as the speaker, must give out the maximum power. Remember that, both should not blow each other. The RMS sent maximum power continuously to the speaker without getting it spoiled. On the other hand, an amplifier uses the power for the maximum output without getting it overheated. So, keep both the RMS and the amp close to each other. Also, don't forget to use the same ohms for the best sound. At first, I have a pro tip for your safety. Never forget to use tape while working with cables and electricity. As the battery or electricity provides power to the speaker, you can land up amplifying the sound of the speaker. Now, find the firewall of the car. You can see a metal wall under the good of the car. It may be near to the windshield. Once you find the opening end, the other end of the firewall will also be inside the car. However, take a long enough wire to connect the firewall through the hole. Then remove the insulation of the wire to the battery’s end. Remember, you should not connect the wire to the battery now. Now it’s time to connect the stereo head unit. Look the back of the stereo head unit to find two RCA connections. Now, you have to move the RCA cables through the back of the console in the center. After moving the cables, plug them behind the stereo head unit. After connecting the cables behind the stereo, now find other one or two blue cables. There will be at least two cables, but in most cases, you'll find two blue wires. Among them, one wire must be labeled to use with an amplifier. Now, cut the blue wire to use with the amp. After having all the steps as mentioned earlier done, now place the speaker in the box perfectly. Before that, you should ensure that the thin gasket of the speaker is still on it. Also, you have to connect the wires to the speaker that are outside the box. Then screw the speaker into the box. After that, set the subwoofer in the trunk and place it in your car. Now you are at the last step to connect all the cables to the amplifier. After that, connect the power cable to the battery. The wire should be placed between the battery clip and the post on the battery. Here, you must set the large fuse inside the fuse holder. After completing all the steps, now test the connections by switching on the speaker. If everything is alright, the speaker sounds loud music. Enjoy with deep bass and loud music. The subwoofer can enhance your experience of listening to music and movie dialogues by applying some notches. It is a significant advantage for the audiophiles who don't want to compromise with the sound quality. But, everything you want to get from the subwoofer depends on the high-quality enclosures and installation. On the contrary, your experience on using a subwoofer can be downhill if you use or install it incorrectly. Moreover, the sub-standard enclosures are also responsible for providing below the average sound quality. But the most important thing is that the new users think the installation is easy and they make mistakes while installing without following the guidelines. So, installation in a correct way is as much necessary as the high-quality enclosures are. Then, you’ll like the experience of listening movie sound or your favorite soundtracks through the subwoofer.